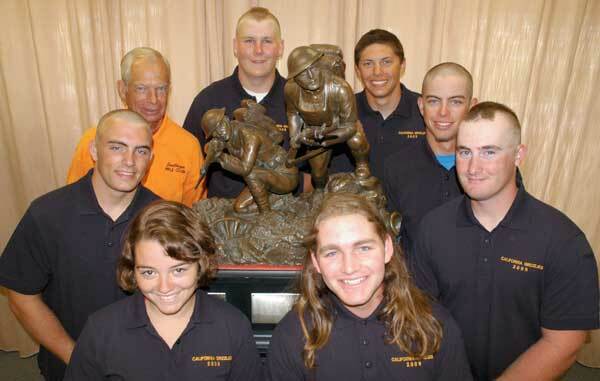 The California Grizzlies O'Connell celebrate as they are named the 2009 National Trophy Infantry Match winners at Camp Perry. The team shot a 1284 to win the match and make history as the first junior team to event claim the trophy. 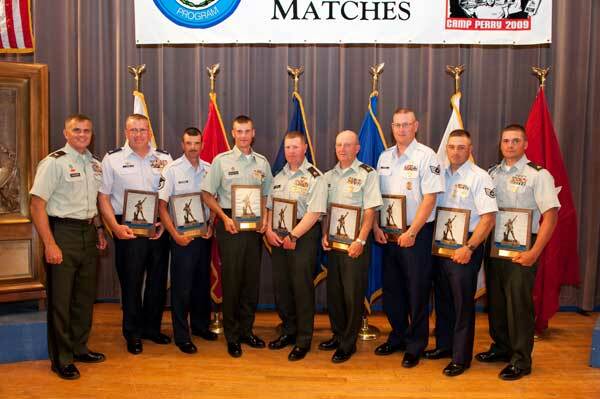 If you were trying to predict the winner of the 2009 National Trophy Infantry Team Match (NTIT), odds are your discussion centered around the top military teams in the event. This makes sense; especially considering that the last time a civilian team won the NTIT was in 1930. That is until a group of juniors from California stepped up to the firing line at Camp Perry on 7 August and made history. California Grizzlies O’Connell shot a 1284 to win the NTIT, becoming the first junior team to ever win the event and the first civilian team to win in 79-years. In fact the top three teams in the NTIT were civilian, in what became a very historic and bizarre day at Camp Perry. Forbes Rifle and Pistol Club finished second with a 1275 and Oklahoma Rifle Association finished third with a 1250. USAMU Praslick, who won the National Trophy Team Match (NTT) the day before, finished in a distant forth with a 1211, and was only one of two military teams to even make the top 10 in the NTIT. The California Grizzlies O’Connell team was named for team coach Jim O’Connell. The team captain was Anthony Henderson, and firing team members were Cheyanne Acebo, David Bahten, Matthew Chezem, Chad Kurgan, Joshua Lehn and Jim Minturn. The team is based out of the Yosemite area in central California, but team members come from all over the state. California Grizzlies Team Captain Anthony Henderson double checks the score card in the National Trophy Infantry Match on 7 August. The Grizzlies were the first junior team to ever win the event and the first civilian team since 1930. The Grizzlies have been a contender in recent years, finishing fifth in the 2008 NTIT and setting a junior record with a 1233, a number they shattered with their victory this year. The team also won the junior title and set new records in 2008 and 2009 in the NTT, shooting a 2870 this year to finish eighth overall. Also the group consistently has team members in the President’s 100, with several Distinguished shooters on the team and others receiving as many as 14 EIC-points at the 2009 National Trophy Matches. The group’s accomplishments are particularly impressive considering that California State Law prohibits juniors from handling rifles with a removable magazine. In California the team can only practice with a fixed 10-round clip that can only be removed using a tool. This makes training for rapid fire difficult, and the only time the team gets to practice with standard removable clips is when they arrive to Camp Perry for the National Matches. This does not mean that the group is not putting in a lot of training time. The team’s season starts in March and goes through September, but with the group spread out over a 700-mile span, they can only get together as a whole team a few times during the year. One of those team meetings comes in the summer, when the team attends Camp O’Connell, lead by the team’s coach Jim O’Connell. The eight-day camp is held at the remote Coalinga Rifle Club in Central California, where team members sleep in tents and do range maintenance projects in addition to their training. California Grizzlies Team pose with the Infantry Trophy. This is the first time the trophy will be engraved with the winning Junior Infantry Team name. This is just part of what goes into the team unity that is evident with the group, which brought 16 juniors to the 2009 National Matches. “We are very team oriented,” said NTT and NTIT firing team member David Bahten, who was sporting a mohawk that the team had cut into his hair the night before. This was Bahten’s seventh year on the team, and he said the haircut that he and his teammates were sporting was just one of the traditions for the Grizzlies that made them so close. “Every year we give the new comers haircuts at the National Matches. They get to pick the cut that they want, and many of the veterans join in, it is part of the team’s camaraderie,” said Bahten. Tim Finicle of Murphys, California believes the high expectations placed on team members, and the responsibility they are given through marksmanship training play a large role in the teams success. “Everyone on the team is expected to uphold a Code of Ethics that is signed when joining the Grizzlies,” said Finicle whose son and stepson are on the team. “These juniors represent a sport that not everyone is in favor of, so they have to be exemplary,” he added. Finicle’s sons joined the team in 2003 when the California juniors barely had any support. At the time, only two shooters were on the team, Tyrel Cooper, who now shoots for the USAMU and his sister Samantha. That year six new shooters, including Finicle’s sons, joined the team and the group slowly progressed. Finicle attributes a lot of this growth to an introductory program that the Grizzlies have established to attract new shooters. “We have a .22 program that introduces the sport to about 160 juniors a year, ages 10-16. If juniors show interest in this group, they move to the farm team where they shoot AR-15’s at 100-yard reduced targets until they reach Sharpshooter classification. This shows they have the interest to get better, then we let them on the team,” said Finicle. Part of the team’s success can also be attributed to the group sharing team goals coming into the 2009 National Trophy Matches. “We wanted to break the National Trophy Team and National Trophy Infantry Team junior records that we set last year,” said Bahten. “Winning the Infantry Match makes practice feel worth it. You begin to wonder what you are doing on really hot days of practice and think there won’t be a payout, then you come here and it is all worth it,” said NTIT team captain Anthony Henderson, who is in his sixth year with the Grizzlies. When looking at the recent accomplishments of the California Grizzlies O’Connell team, you realize that their surprise upset in the NTIT was really not that much of a stretch for the group. In fact, their accomplishment follows a growing trend of talent coming from the junior highpower programs across the country. The All Guard Gold Team won the Celtic Chieftain Trophy for being the top Reserve Component in the National Trophy Infantry Team Match. Coach Brad Palmer has seen the success of junior highpower programs with his own team, the Connecticut Juniors. The 2009 winner of the Mountain Man Trophy, SPC Jeffery Mendyka ARNG, was a product of the Connecticut Juniors program, which he shot for from 2002-2007. SGT Kristoffer Friend USAR, who won the 2007 President’s Match, was also once a member of Palmer’s team. These are just two of a long list of shooters from the Connecticut junior program who have made waves at the National Matches. He believes the increased opportunities for juniors to compete at the National Matches attributes to the success of junior programs in recent years. “Juniors used to come to Camp Perry to go to the schools, shoot for two days, then pull pits the rest of the week,” said Palmer, “Also, 21-years-ago when I started there were very few people dedicated as junior coaches in highpower programs,” he added. For his teams, Palmer believes success comes from giving juniors the resources to excel if they wish to, and giving them the chance to shoot against the top shooter and receive instruction from the top coaches while at the National Matches. “When I bring shooters to Camp Perry, the idea is not to just win junior events but to win overall,” said Palmer. “We are training the next generation of leaders in our sport. You can teach anybody to shoot 10’s, but getting them to do it consistently under different conditions is the trick,” he added. To see complete results from the 2009 NTIT go to http://clubs.odcmp.com/cgi-bin/report_eventAward.cgi?matchID=4689&eventID=15&awardID=1. For more info about the California Grizzlies go to http://www.teamgrizzlies.org/. To find a junior highpower program in your state contact your CMP State Junior Director, contact info can be found at http://www.odcmp.com/Programs/SJD.htm. PROGRAMS: For marksmanship training, competitions, National Matches, safety information and youth marksmanship. Port Clinton, Ohio 43452 SALES: For government surplus rifles and ammunition, CMP products and CMP memorabilia.